Haiti is one of the few countries in the world where superstition plays a major role in every aspect of people's live. 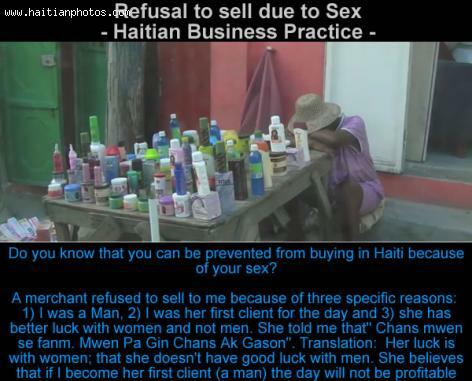 Something you would not believe but happens to be true and according to many people I talk to, it is common practice in the Haitian society. I was in shock because a merchant categorically refused to sell to me and it has nothing to do with my skin color because she and I are Black. Would you believe that she did not want to sell to me because of three specific reasons: 1) I was a Man, 2) I was her first client for the day and 3) she has better luck with women and not men. She told me that" Shans mwen se fanm. Mwen Pa Gin Chans Gason". Translation: Her luck is with women; that she doesn't have good luck with men. She absolutely believes that if her first business transaction for the day is with a man and not a woman, her entire day will not be profitable.